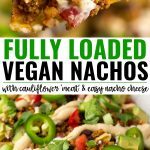 Ultimate Fully Loaded Vegan Nachos, with easy vegan nacho cheese sauce, cauliflower mushroom walnut taco meat, black beans, diced tomatoes, jalapeños, cilantro, and optional vegan sour cream and avocado. Easy dinner or appetizer! 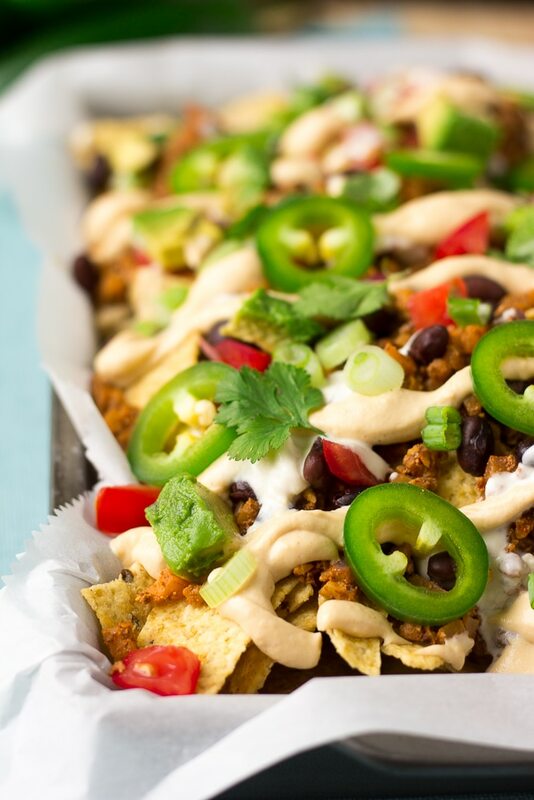 These nachos would be the perfect food for game day, when you have some non-vegan friends over, or even just for a fun weeknight meal! I like to keep all the ingredients separate, and then let everyone choose exactly what they want to top their nachos with. First of all, choose your favorite tortilla chips. I like Trader Joe’s organic white tortilla chips personally, but make sure to grab some quality tasting ones. 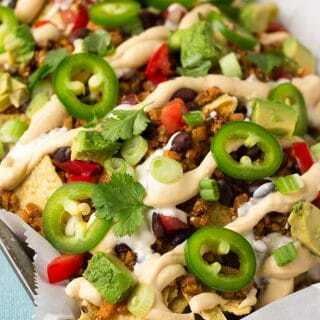 How do you make vegan nachos? Layer the toppings, and serve. Easy peasy! That’s it. 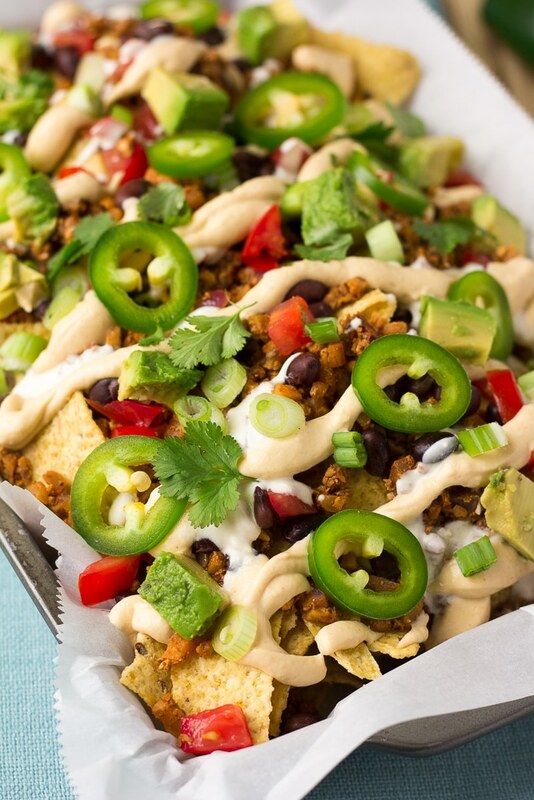 These are the most delicious and hearty vegan nachos you'll ever have! 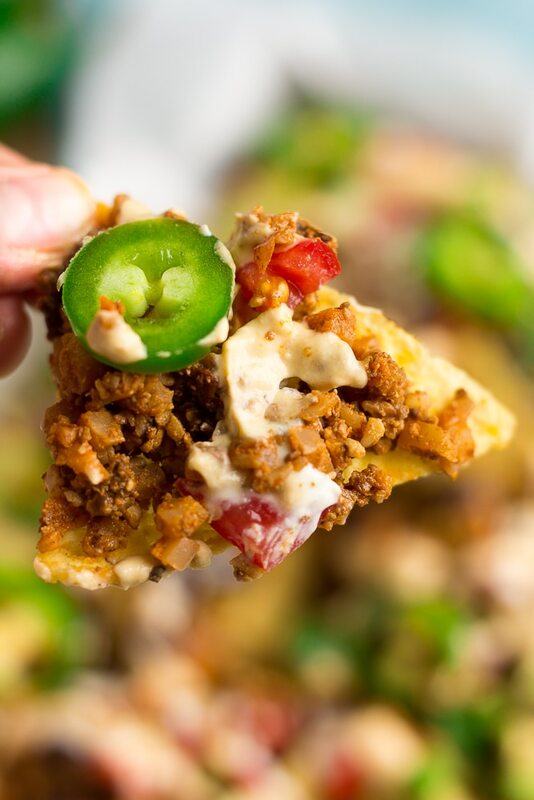 The easy vegan nacho cheese sauce and taco "meat" really make these nachos incredible. Feel free to adjust the other toppings to your preference! First, make the Cauliflower Walnut Mushroom Taco Meat. Now, make the Easy Vegan Nacho Cheese Sauce. Once the nacho cheese sauce is warm, drain and rinse the black beans and prepare all the rest of the optional ingredients you wish to use. Arrange the tortilla chips on a large platter (or on individual plates if serving as a meal). Add toppings in this order, or any you prefer: Taco "meat", nacho cheese sauce, sprinkle of black beans, tomatoes, cilantro, jalapenos, onions, salsa/hot sauce and then cashew sour cream and/or avocado/guacamole. Enjoy immediately!